Arrive in Pagelaran district, apart from paddy-field scenery and pekon-pekon in turns apparently also a row was produced by rattan diligence peddled by the side of road. Gotten maintenance ponds of the fish in this territory that was one of the centers of the producer fisheries-land from 17 districts that were gotten in Tanggamus Regency. Since entering this territory, tourists could witness scenery pekon-pekon; the Lampung ethnic group. 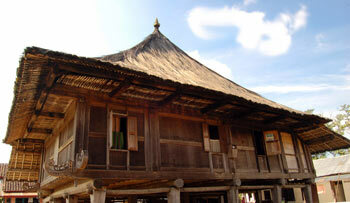 Lamban/Mahhan; the inhabitant’s original Lampung house – Pepadun sub ethnic that dominant in the countryside territory, and Saibatin sub ethnic from the coastal territory still often was seen, in fact was that was the 100 ‘s old the year, some among them in Pekon Tanjung Heran – Pugung district.